Our children are being bombarded with candy from every direction. Chocolate bars, gum, suckers and assorted gummy candies line the checkout lanes in grocery stores. School fundraisers sell candy bars, cookies and brownies in the hallways during lunch hours. Every mall, skating rink, soccer complex, movie theater and even the video store has a place to buy candy. And then there are the holidays. Halloween trick-or-treat bags bulge with every kind of candy imaginable. Christmas stockings are topped with bubble gum and chocolate bars. Chocolate coins are given out at Hanukkah celebrations. Valentine messages are stamped on candy hearts, and candy itself is the staple of communicating love. Kids are given candy treats and baskets for Purim. Easter baskets overflow with jelly beans and chocolate bunnies. Candy is everywhere and its presence is wreaking havoc on our children’s teeth and waist lines. Children are visiting the dentist with serious tooth decay at younger and younger ages every year. Obesity in children is a national concern. 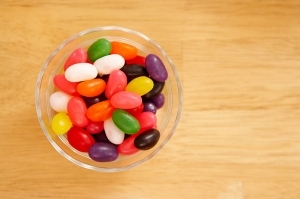 With candy being universally available and within sight of children, what is a parent to do? How do you combat its influence on your children? How do you lessen the influence of advertisers and get candy consumption under control in your family? How can you win the candy wars? 1. Begin by being a model for you children to follow. If you are a chocoholic and find yourself foraging through the cupboard for the last chocolate bar or eating an entire bag of M&Ms once they are opened, reflect on the message you are sending your children. It will be difficult for you to curb your children’s candy consumption when they see you unable to curb your own. Talk to your children about your desire and willingness to stay conscious, and make healthy choices about your own candy consumption. As parents, we set limits around television, computer time, video games, bedtimes, friends and a variety of other items. Setting limits with candy does not mean you make it totally off limits. It means that you provide opportunities for your children to enjoy candy within some clearly defined parameters or guidelines. Discuss with your children how candy consumption will take place before they head out to gather a bag full at Halloween time. Agree on a portion to be eaten each day and a place to keep it. Do not allow candy to be taken into their bedroom. Do not leave bags of candy in the cupboard for easy access. This is part of setting limits and it is your responsibility as a conscious, committed parent to see that it is done. With candy, remind your children that responsibility equals opportunity. Your children have an opportunity to have some candy. If they are responsible with following the parameters you have set, then the opportunity to have it is available. If they are not, access to candy is removed. This could mean you may have to remove all the candy from the house and make it unavailable to anyone. That would include you. Educate your children that candy is not food. It is junk and has no nutritional value for their bodies. Candy and the opportunity to eat it is something special and should be reserved for special moments. Keep candy eating rare and enjoyable. Once the line is crossed and candy becomes an everyday occurrence, the specialness of it wears off and its presence is expected. Have different candy around at different times to bring attention to the special event that the candy represents. Focus on the event and how different types of candy are significant at different times of the year. Talk about the cultural or family significance of what a particular type of candy represents. Change the focus from that of mass consumption to that of significance. When you use candy to motivate your children to perform a particular task or behave in a certain way, you are positioning it as a tool of manipulation. Using candy to get children to behave is a form of bribery and produces children who perform for a reward. In this way, you end up producing a “candy junkie” someone who chases after the next fix of the desirable substance. You are not always going to be present when your children have access to candy. You are not going to be there to enforce a limit for your children or give them choices. You want the ability to curb candy consumption to be inside them. This control will develop in children if you can start early and consistently utilize the suggestions above. Another way to help your children build inner controls is to talk through your child’s choices with him after he returns from a place where you know candy was easily available. Help him think about and talk through his decisions. Your child’s inner authority is the only authority he will take with him wherever he goes. Help him learn to trust his ability to make healthy, responsible choices. By following these six suggestions, you and your children can enjoy the wonderful taste of chocolate and other candies. The holidays can be filled with pleasant moments of special candy consumptions. The “candy wars” will no longer be waged. Instead, eating candy will move from a weight and tooth decay issue to a wonderful time when one can simply enjoy a sweet taste.